See a list of all the books we have reviewed here! Being in the Top 100 books list, I picked up this novel with great expectations that having read it, I’m not certain they were met. What I keep forgetting, however, is that maybe someone that was into crime and mystery novels would appreciate this book more. It had everything a good mystery needs, an elusive serial killer that has police and medical examiners baffled. A calling card left at each scene that has everyone nervous, and a level of suspense that sometimes made me yearn to find out what will happen next. 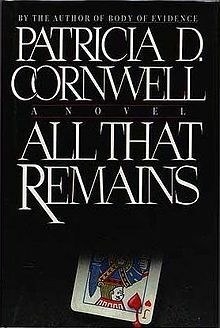 The story’s protagonist, Dr Kay Scarpetta is the chief Medical Examiner left to determine the causes of death of the victims of a serial killer. A task that is not as easy as she’d hoped. This killer is smarter than her and the police investigating the crimes, ever expected. Her years of education and her high level specialist skills are left useless against the decaying bodies that are presented to her. The investigation is taken up a notch when high end politicians become involved and the thoughts of conspiracy theorists are whispered around town. I found the story very impersonal and I felt myself asking questions around the main character and where the story fit with her and the experiences she called upon in a disjointed fashion. It was only once I began to feel so strongly that I was missing something that I researched the book further and found that this novel is only one in a series with this character, and this book was not the start. To date there are 22 books in this series and this book is the third. In considering I read this book out of order, I give this book 5 calling cards out of 10. I plan on reading the first in the series and reassessing this novel after that.